OK, this was just a quick snap of the moon tonight to see how I handled the cold, to determine if I wanted to actually try shooting the eclipse later tonight. I have taken decent moon shots in the past, but this time I wasn't really set up correctly, dinner cooked faster than expected and I had two cats fighting me at the door to come out with me. This picture has no edits....what the heck happened here? 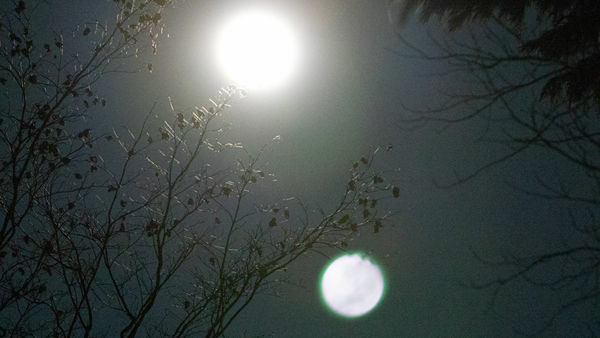 Why do I have two moons? It was a quick shot with a Canon 7D Mark2 and a Tamron 150-600 G2 lens on a tripod. For the first time, I didn't bother with the lens hood. I was so flustered with what I was seeing while (gasp) chimping I think this might have been shot in P mode, which I don't typically use. LR is showing ISO of 16000 (I had initially set it to 200), 1/15 sec (initial ss was 250), f/5.6 (initially 8) and it was all downhill from there, lol. A quick Google online said something about Cosmic Variance/Ghost Moon. Can one of you guys enlighten me on this? I'm really curious about it. Admittedly, it is a ghastly photo! Looks like a flair from the filter on the lens. Remove the filter, retake the image and I am sure it will disappear. Good luck. It's a high end UV filter to protect the lens...can you explain how it might cause this? Edit to add: so, you think the filter caused a flair, right? It could be your protective front filter or it might be the numerous lens elements in your long, long zoom. Sometimes just finding the correct angle of attack can eliminate this type of ghosting. I hope it's just your filter. This. Plus its massively overexposed. Agreed, but that didn’t bother me since I went out primarily to see how I would handle the cold. Having taken good moon shots before I wasn’t concerned with the poor result...mostly just curious about having two moons, lol. Pretty sure I got good ones during the actual eclipse, though I opted for a warm bed vs importing the images. -1 out during shoot and -8 now! If you went from a warm interior to a cold exterior I would say you didn't give your gear enough time to acclimate and you got a little fogging under the UV or in the lens itself. You need to give the Camera and lenses time to cool down closer to ambient temps to get rid of the fogging. Same is true going from outside to in, even more so. Just picture the condensation on a glass of ice water - same happens to your cold camera. Yes, I considered that. Judging from varying Facebook shots it appears mine wasn’t the only anomaly. It had a good creepy factor for many, lol. It could be the fact that you moved to another planet. Why not? It does have wide open spaces.